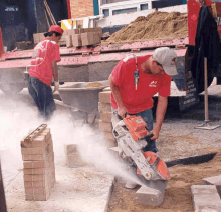 OSHA has issued two standards to protect workers from exposure to respirable crystalline silica. One standard is for general industry and maritime and one standard is for the construction industry. The construction industry standard, 29 CFR 1926.1153 was originally scheduled to begin June 23, 2017, however, enforcement will now begin Sept. 23, 2017. OSHA estimates that 2.3 million workers are exposed to respirable crystalline silica in their workplace. Exposure to crystalline silica can cause silicosis, lung cancer, other respiratory diseases, and kidney disease. Exposures can occur from saws, grinders, drills, jackhammers, chipping tools and a variety of other tools, and even from pouring sand from bags. Preparation and implementation of a written exposure control plan. Designation of a competent person to implement the plan. Restricting practices that expose workers. Offering medical exams to potentially exposed employees. Recordkeeping on construction sites which involve hazardous materials, exposure to crystalline silica may need to be included in the site specific Health and Safety Plan. The new Permissible Exposure Limit (PEL) is 50 µg/m3 (8 hour time weighted average) and the new Action Level is 25 µg/m3 (8 hour TWA). If adequate engineering controls cannot be implemented to limit the exposure below the PEL, then respiratory protection will be necessary.